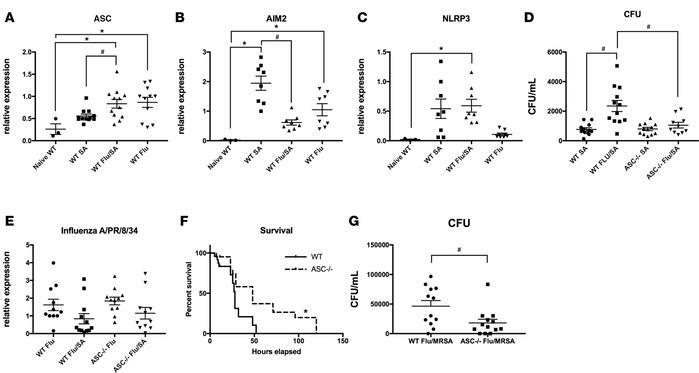 The ASC inflammasome promotes decreased bacterial clearance and increased mortality during influenza and bacterial superinfection. C57BL/6 mice were infected with 100 PFU of influenza A/PR/8/34 or vehicle for 6 days, and then challenged with 108 CFU of methicillin-sensitive Staphylococcus aureus (MSSA) or vehicle for 24 hours. (A–C) Gene expression of inflammasome components in lung (n = 3–12). C57BL/6 and ASC–/– mice were infected with 100 PFU of influenza A/PR/8/34 or vehicle for 6 days, and then challenged with 108 CFU of MSSA or vehicle for 24 hours. (D) Bacterial colony counts in lung homogenate (n = 10–12). (E) Gene expression of influenza matrix protein in lung (n = 11–12). (F) Survival curve for WT and ASC–/– mice challenged with influenza followed by MSSA (n = 8). (G) C57BL/6 mice were infected with 100 PFU of influenza A/PR/8/34 or vehicle for 6 days, and then challenged with 5 × 107 CFU of methicillin-resistant S. aureus (MRSA) or vehicle for 24 hours (n = 12). *P < 0.05 versus naive WT by 1-way ANOVA; #P < 0.05 comparing SA with Flu/SA by unpaired t test. Data points reflect individual values ± SEM. Each experiment was independently performed at least twice and data are shown from combined experiments with the exception of naive mouse data, which was performed once.